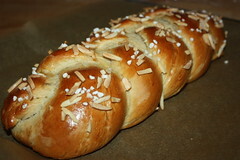 With the Finnish Pulla we finish (haha) this 2012-TWD-year. When I saw the picture I was afraid it is one of these very much time consuming, almost not possible to knead with a hand-mixer brioche breads. Well, it's not. It takes some time for resting and rising, but compared to other yeasted breads the rising times are not too long (two times 45 mins), so you can easily do it in a half a day. And the dough is not so extremely dense as a brioche. Additionally, you can easily knead it with your hands. What is, after all, a nice experience. The Pulla (is it simply called Pulla? or Pulla Bread?) is a basic recipe, not too much fuzz, and still a bit exraordinary due to the cardamom in it. The almonds and sugar on top makes it look very lovely. I made only half the recipe, so my strands were not long enough to make a circle. But the book also gives a picture of a "loaf" so I guess it's ok to shape it like I did. All in all, this is an excellent recipe for a brioche-like bread! And: Although I like to bake seasonally, I am also very thankful for having a recipe this week that is NOT overloaded with sugar, almond paste, cinamon and nuts. I was in the need of a break. Seriously. For the recipe, head over to Erin's blog The Daily Morsel or have a look at pp 106/107 in Dorie Greenspan's book. I too was afraid it was going to be a long process when I saw the picture of this bread. But was pleased with how easy it was. I think I would make it as loaves next time, as I think it looks good like that. And it was nice to make something that wasn't all sugar! It was sweet but not in a sugary way. It's nice to have something a little lighter at this time of year, but still full of flavour. Your loaf of bread looks lovely, and sounds as though it tastes delicious. Wishing you happy holidays.